as people thought, of Joseph…. son of Heli, son of Matthat, son of Levi, son of Melchi, son of Jannai, son of Joseph, son of Mattathiah, son of Amos, son of Nahum, son of Esli, son of Naggai, son of Maath, son of Mattathiah, son of Semein, son of Josech, son of Joda, son of Johanan, son of Rhesa, son of Zerubbabel, son of Shealtiel, son of Neri, son of Melchi, son of Addi, son of Cosam, son of Elmadam, son or Er, son of Joshua, son of Eliezeer, son of Jorim, son of Matthat, son of Levi, son of Symeon, son of Judah, son of Joseph, son of Jonam, son of Eliabim, son of Melea, son of Menna, son of Mattatha, son of Nathan, son of David, son of Jesse, son of Obed, son of Boaz, son of Salmon, son of Nahshon, son of Amminadab, son of Arni, son of Hezron, son of Perez, son of Judah, son of Jacob, son of Isaac, son of Abraham, son of Terah, son of Nahor, son of Serug, son of Reu, son of Peleg, son of Eber, son of Shelah, son of Cainan, son of Arpachshad, son of Shem, son of Noah, son of Lamech, son of Methuselah, son of Enoch, son of Jared, son of Mahalaleel, son of Cainan, son of Enosh, son of Seth, son of Adam, son of God. Tracing our own DNA back into the distant past has become possible in the 21st century, and millions of people are now doing just that. People who were adopted as children are discovering their birth parents; people who thought they knew their family history are discovering facts (and secrets) they never knew. We may read Jesus’ genealogy and think, “Who really cares?” But the Jews cared very much, and it turns out that we do, too. How odd, though, that knowing our own DNA (99.9% of which we share with every human on earth) can lead us to concentrate on the .1% (our own particular ancestors) without remembering that we are all connected. Matthew’s gospel begins by tracing ancestry back to Abraham (see Matthew 1:2f), but Luke traces it all the way back to Adam, the ancestor of all human beings. Luke’s story of Jesus links him to every person on earth, not just to his Jewish ancestors. 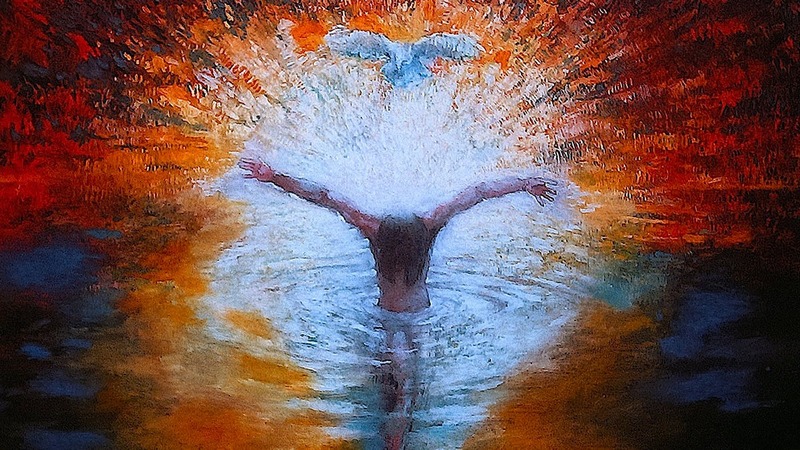 Baptism of Jesus – Jay Bonnell, 20th c.
Dove: How is the Holy Spirit like a dove? 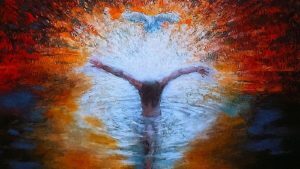 From the gospel writers to artists through the centuries, the Holy Spirit has always been portrayed as a dove. The dove, however, is always and only a metaphor. No words, no images can ever fully convey how the Spirit works. In the Temple, when Jesus was twelve years old, the question may have first alighted: What did God have in mind for him? That’s how the Spirit begins to work in us (stirring within us, planting questions in our minds). In Nazareth, as Jesus grew up, the ideas may have shifted in his mind: Where was God leading him? That’s how the Spirit continues its work in us (in conversation with our traditions and communities, our new experiences and new ideas). In the Jordan, as Jesus rose out of the waters, the immensity of God’s call must have filled his mind, and pointed him towards his future ministry. That’s how the Spirit continues its work in us (hinting at the shape of things to come). Sometimes, in moments we will never forget, we also are fully aware of the Spirit descending, even resting on us — like a dove returning to her nest, making her home in our hearts. That’s how the Spirit works. in the Temple at Jerusalem when Jesus was twelve. extraordinary hopes for him, a special plan. in wisdom and in years in quiet little Nazareth. baptized Jesus. In that moment, Jesus knew! A dove settles lightly wherever it chooses to rest. The Holy Spirit also settles lightly upon us, calling our attention but never forcing us. At his Last Supper (see John 14:16f and John 16:12f), Jesus will use these words to describe how the Holy Spirit works: abides in us; makes a home in us; reveals Jesus to us; reminds us; teaches us; guides us; reveals the truth to us; gives us peace. In this and in many other ways John made his appeal to the people and announced the good news. But Prince Herod, when he was rebuked by John over the affair of his brother’s wife Herodias and for his other misdeeds, added to them all by shutting John up in prison. Fire: What did John mean by “fire”? John stands in the waters of the Jordan River, but instead of pointing to the flowing waters he evokes images of fire. What is someone, standing undecided on the river bank, to think of these images? There is the fire of judgment, an image of eternal damnation as widespread in our own time as it was in John’s. There is the fire of engagement, which points us in new directions and empowers us to see in new ways. If we see only one of these images, we will miss the whole picture. John uses two contrasting images of fire — the destructive fire of judgment: “He will burn the chaff on a fire that can never go out” (Luke 3:17); and the empowering fire of the Holy Spirit: “He will baptize you with the Holy Spirit and with fire (3:16). The poor, as Jesus will tell his disciples, are with us always (see Mark 14:7). 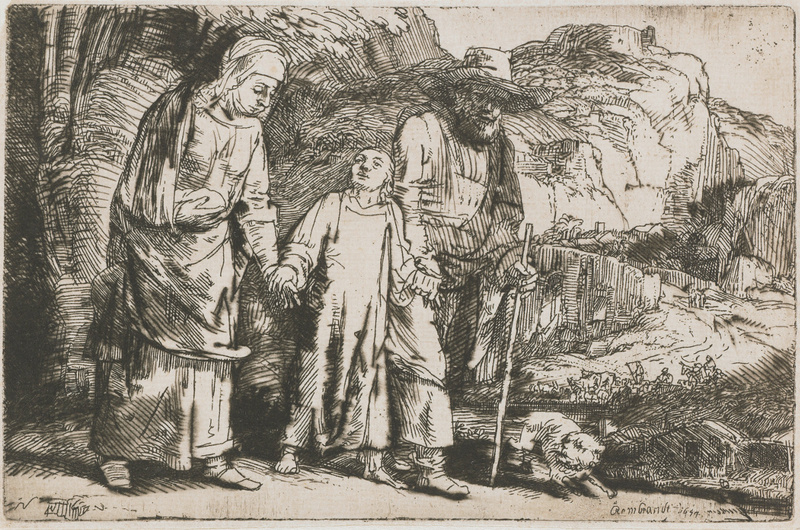 Since the poor are all around us, does Jesus mean we should walk by them without seeing them? Should we make a practice of helping at least one poor person on our way to our own work? Should we try to stop for every poor person? Or should we stop to look, not just at one person or several, but at the whole picture, and commit ourselves to working with others to make adequate space for everyone in our world? In Biblical Hebrew, the idea of repentance is represented by two verbs: שוב (shuv, to return) and נחם (nacham, to feel sorrow). In New Testament Greek, the word is μετάνοια (metanoia). Metanoia combines ‘meta’ (beyond, after), with ‘noia’ (to perceive, to think). Metanoia is therefore not just sorrow and a plea for forgiveness; it is primarily a change of consciousness. Only a new way of thinking will lead us into a new way of acting. John the Baptist – El Greco, 16th c.
In a time of great social unrest, political turmoil, and desperate poverty alongside extreme wealth – a time not unlike our own time – John the Baptist comes with a renewed vision of life with God and neighbor. But to see that vision, all the obstacles need to be removed. To clearly see the possibilities of a room, all the old furniture must be cleared away. What small things am I so used to that I can’t see past them to the bigger picture? In John the Baptist’s time the Essenes, an ascetic Jewish sect who had retreated to the desert, practiced daily ritual bathing; but ritual bathing was also quite common for ordinary Jews. Natural lakes and rivers were regarded as the most desirable places for ritual bathing; but a cistern, a fountain, or a ritual bath (a mikveh) was also permitted. Archaeologists have discovered many ancient mikva’ot in Jerusalem – near synagogues and public places, but also in private homes. The Law required ritual bathing whenever a person became unclean (see Leviticus 15); and by the time of John the Baptist ritual bathing had also become a traditional practice before entering the Jerusalem Temple. In Israel and throughout the Roman Empire, ritual bathing was also the final step for everyone converting to Judaism. 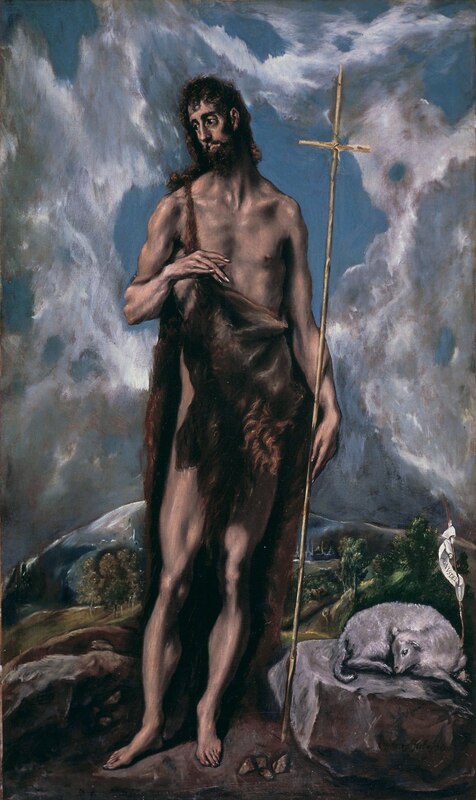 John the Baptist seems to have connected the ancient Jewish practice of ritual cleansing to his own call to baptism for the forgiveness of sins. In today’s gospel reading Luke tells us how Jesus called his first disciples. (Luke 5:1-13). Luke’s version has many more details. Luke tells us that Jesus is not just walking along the lakeshore: he’s been teaching, and the crowd is already so large that it is pushing him into the water. So he asks Simon (who is washing his nets after a long night of fishing) if he can sit in his empty boat, and Simon agrees. So Jesus climbs into Simon’s boat and continues his teaching. And then, instead of getting out of the boat when he’s finished, Jesus tells Simon to take the boat out again, into the middle of the sea, and put his nets down in the water one more time. But Simon (who perhaps didn’t care if Jesus sat in his boat while the nets were being cleaned) now objects to going back to work, because he knows there aren’t any fish out there. Yet (perhaps impressed with Jesus’ authority after hearing him speak to the crowd), Simon agrees to take the boat out again – and now the nets are filled with fish. Over the years, this part of Luke’s story has sometimes been called the “miraculous catch”. But the catch didn’t have to be a miracle – there were often large shoals of fish in the sea of Galilee. One fisherman might not be able to see the fish from his boat, but a man in another boat could; or someone standing on the beach might see them very clearly. So Jesus didn’t make the fish appear, nor did he need extraordinary eyesight; he could have just seen the fish, and pointed them out to Simon. So where’s the “miracle” in this story – is it about catching fish, or is it about seeing in a new way? What if we could see in a new way? With the right kind of vision, everything “snaps” into place. Then we begin to see details we’ve forgotten all about, or perhaps never seen before. When our oldest son was about 8 or 9, he got his first pair of glasses. I remember how excited he was, riding in the car on our way home from the eye doctor – he was just bouncing up and down in his seat, pointing out things he had never seen before on the street he’d traveled so many times before. For the first time in his life, he was seeing everything – the whole picture. And, more relevant to me all these years later, friends have had cataract surgery, and once the old lenses were gone, suddenly they were seeing see true colors again – no more yellow light clouding their vision. What if we could put on a pair of glasses that allowed us to see the world the way God sees it? What if we asked Jesus remove the film from our eyes? 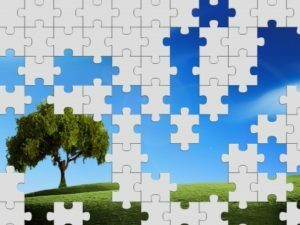 Jesus tells us that God sees differently than we do – God sees not just the details, and God sees not just the true colors, but God sees the whole picture. When we begin to understand this – that God sees the world differently than we do – we’ve taken our first step towards seeing the world the way God sees it. When we are willing to let go of our cataracts – let go of our comfort with the ways things seem to be; let go of our acquired cynicism, our hopelessness, our fears for the future, our partial experience that we thought revealed the whole picture….then we’re letting ourselves see the world the way God sees it. Seen through God’s eyes, the whole world is interconnected. God sees that I’m connected to you, and you’re connected to others, going back through our DNA all the way to the beginning of time. God sees the rich connected to the poor, and the powerful to the powerless, and citizens to non-citizens… And in God’s eyes you and I, and every human being on this earth, we are all connected to the earth itself, and to every single plant and animal on this earth. And the bond of interconnection, the bond that connects us to each other (whether we see it or not), the bond that connects us to our Creator, the bond that connects us to the natural world, that bond is love. At the very beginning of his ministry, Jesus is already seeing with God’s eyes. He has come out of his 40 days in the desert to his home country, Galilee, and begun to teach. But just a month from today, the gospel for the first Sunday in Lent will take us back into the desert, reminding us of the temptations Jesus faced. When that morning comes, listen carefully to each temptation the devil offers Jesus. With each temptation, the devil will paint a picture for Jesus – a picture of bread for a hungry man; a picture of political power for a man hungry to make the world a different kind of place; and a picture of spiritual power for a man hungry for God. But Jesus will respond to each temptation with another picture – a picture of food that truly nourishes; a picture of political power that also shows the human cost; and a picture of spiritual power that sees the world in its true colors. And that spiritual power is love. What if we could see God the way Jesus saw God? Since the New Year started, I’ve been reading through Luke’s Gospel and I’ve seen that this same message comes to every person in the story: to Zechariah and Elizabeth, the parents of John the Baptist; to Mary, the mother of Jesus; to the shepherds out in the fields; and now to these fishermen on the sea of Galilee…. The message is always: Don’t be afraid. Don’t be afraid of God! But long before we try to bring someone to the Way of Jesus, we need to learn how to see God the way Jesus sees God. Then — looking at God through Jesus’ eyes — we can begin to see the world the way God sees it. Only then can we truly share Jesus’ message with others. Jesus tells his disciples (and us): Don’t be afraid. God loves you, and welcomes you, and will always be with you. So let’s take the first step today: Let’s ask God to rip off our cataracts. Let’s lift our eyes to the face of a loving God. Let’s try to see the world as God sees it. And above all, let’s learn to love as Jesus loves. Preached at St. Patrick’s Episcopal Church, Kenwood, on February 10, 2019. Now it was the practice of Jesus’ parents to go to Jerusalem every year for the Passover festival; and when he was twelve, they made the pilgrimage as usual. When the festive season was over and they started for home, the boy Jesus stayed behind in Jerusalem. His parents did not know of this; but thinking that he was with the party they journeyed on for a whole day, and only then did they begin looking for him among their friends and relatives. As they could not find him they returned to Jerusalem to look for him; and after three days they found him sitting in the Temple surrounded by the teachers, listening to them and putting questions; and all who heard him were amazed at his intelligence and the answers he gave. His parents were astonished to see him there, and his mother said to him, “My son, why have you treated us like this? Your father and I have been searching for you in great anxiety.” “What made you search?” he said. “Did you not know that I was bound to be in my Father’s house?” But they did not understand what he meant. Then he went back with them to Nazareth, and continued to be under their authority; his mother treasured up all these things in her heart. And as Jesus grew up he advanced in wisdom and in divine and human favor. and what he had to do. the crux of his own purpose. it brought him back to ground. 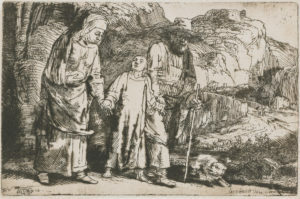 The family returned to Nazareth. As today’s Muslims hope to journey to Mecca at least once in their lives, so in Jesus’ day all Jews hoped to journey to Jerusalem to celebrate the Passover. All adult male Jews who lived within fifteen miles of Jerusalem were required to attend the Passover at the Temple, and those who lived farther away often made the pilgrimage as well. A Jewish boy became a man when he was twelve years old, and so at twelve Jesus joined the caravan going to Jerusalem from Nazareth in Galilee.